After breakfast we checked out and took a taxi to Akumal. We didn’t have any hotel booked, but had found one on the internet that looked promising (Vista del Mar in Half moon bay). Our taxi driver dropped us off there, and luckily they had a nice and cheap room for us right on the beach. We haggled with a taxi driver and got a good price for a return drive to Aktun Chen, a national park just outside Akumal. There we had a guided snorkeling tour of a cenote, and were allowed to swim around as long as we wanted. Since the water in the cenotes is quite cold, we were ready to go back after about an hour. 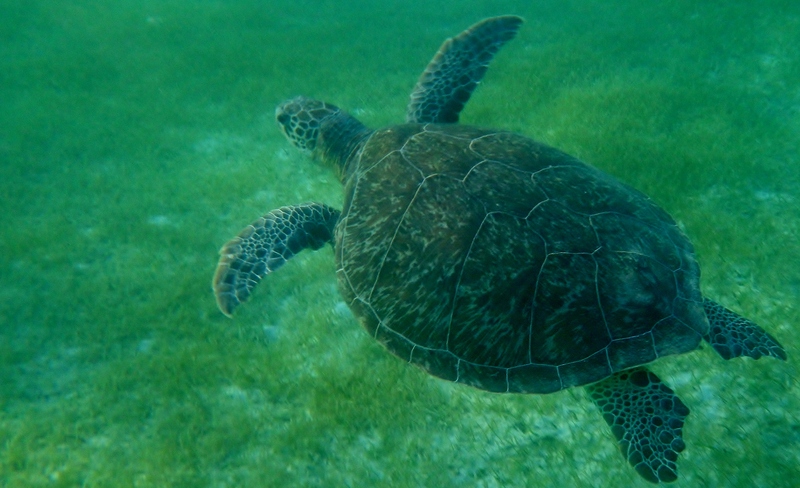 We were back in Akumal around 1630, and decided to buy flippers and try to find the sea turtles by swimming from the beach. Since we only had about an hour before sunset we didn’t expect too much, but got really excited when we saw a turtle after only 10 minutes of snorkeling. Before we had to go back in we saw two other turtles, a stingray and lots of fish. Fun! We got up early to beat the tourist buses to Tulum ruins, were there just after they opened at 8 and had the place pretty much to our selves. Tulum was an important port in the Mayan trade routes and is one of the best preserved costal Maya sites. The ruins are situated on 12 meter high cliffs and we took a swim from the beach to get the view from the sea side. Back at the hotel we had a big breakfast with lots of fresh fruit, and then we went snorkeling for more than an hour. There were not too much fish in the area but we saw a few big ones, and discovered that cold water (probably from the cenotes) were coming up from the sea bed. We were thinking of going snorkeling in a cenote, but ended up spending the afternoon relaxing on our sun beds drinking Piña Coladas. In the evening we tried out both Mexican and Mayan coffee, which the bartender mixed by our table in a spectacular way with lots of fire. We checked out of the hotel at 11 and took a taxi to the beach. We walked along the beach checking prices and looking at the rooms. We ended up in a private cabana at Playa Azul with a small terrace with chairs and a hammock. We took a taxi back to Posada Luna del Sur to pick up our bags, but ended up having a beer on the terrace before saying goodbye. We were also treated with a fresh coconut from Tom’s Mayan neighbor. Back at the beach we went for a swim and tested our new masks and snorkels. Before dinner we had a long walk on the beach with the jungle on one side and the Caribbean sea on the other. There were hardly any people and the sunset was magnificent. We had a great dinner at the terrace with only a small candle light on the table. We woke up to a cold breeze from the north, so we decided to have a slow day. We did some sightseeing in the back streets of the city on our bicycles. Tulum is not a city with a lot of sights, but it is interesting to see Mayan houses mixed with modern Mexican buildings. Parts of the population in Tulum does not speak Spanish, only Mayan, and in addition to the famous Tulum ruins there are several Mayan sites in the city center. After brunch we bicycled out to the Tulum ruins (25 minutes) to get an overview. We spent most of the evening in the terrace, and went to El Pator (known for the best tacos in town) for a late dinner with Penny & Linda. They were goooood! After an ice cream stop we went to a kiosk to buy a few beers. We were told that it was too late to buy beer, but after a short discussion we went home with a six pack of beer hidden in a cardboard box. Since we agreed with Penny to share a taxi to Coba, we got up early and were picked up at 0830. It took about 40 minutes to get there, and there were hardly any cars in the parking area. We had a 45 minutes guided tour of the main sites, before going on our own through the jungle to the highest temple the second highest Mayan temple (Nohoch Mul – 42 meters). This is the only temple you are allowed to climb, and it will probably be closed off next year. Of course we climbed to the top where we were astonished that there were hardly any wind although it was quite windy down below. On the way back we stopped by several other ruins, where the most impressive ones were the watch tower and the ball court. Back in Tulum we had lunch at Pollo Bronco which is a local restaurant that buys fresh chicken in the morning and closes when they are sold out. Highly recommended! After more than two weeks of travelling we needed some European food, and ended up in an Italian restaurant and had great pizzaa bottle of Montepulciano red wine. After dinner we met Anthony and Martine in Caribe Swing. Later we walked down the main street to find a more lively bar, but it was obviously a slow night in Tulum. We still had a great evening together, and look forward to keep in touch. After a very good night’s sleep we went up to the terrace for a Mexican breakfast (including tortillas and salsa of course). There was a short rainfall just after breakfast, so we spent some time blogging before going out to explore the city. We found a cozy Mexican/Cuban bar (Caribe Swing) with pictures of Che Guevara on the wall, and had to take a couple of beers there before we went out to rent bicycles for the next days. We ended up bicycling down to the beach where we had nachos, guacamole and some drinks at a small beach resort. Back in the city we went shopping for snorkeling gear, before we went back to the hotel to relax before dinner. We ended up at the small restaurant El Capitan, and while we were there Anthony & Martine that we met in Trinidad showed up. We had a beer with them and agreed to meet them again the next day. We were told that there was a great salsa party every Sunday at La Zebra on the beach, so we took a taxi there. We were a little bit disappointed after our salsa experiences in Cuba, so we went back to the hotel and ended the evening on the terrace. Suddenly it was our last day in Cuba and we had to split up to get everything done. Gunnhild went out shopping while Fredrik shared pictures with Ute. We took a taxi to the airport and were informed that our flight time had changed 1 hour. Later we realized that we received an email about this 10 days earlier, but internet in Cuba was so slow that we did not bother to use it. When we finally boarded the plane we were another hour and a half delayed, but we arrived in Mexico only two hours late. We also got through passport control and customs really quickly, and our bags were already on the belt. We had to wait 20 minutes for our shuttle, and stopped at two resorts and in Playa del Carmen on our way to Tulum. Our driver was obviously tired and drove very fast so we arrived in Tulum 2 hours after leaving the airport. He had a little trouble finding our hotel, but after asking around he found it just off the main street. We were welcomed by our host Tom, who showed us our large double room with a small kitchen and a cozy terrace. He gave us a map of the area and a lot of information about sights, restaurants, beaches etc. At Posada Luna del Sur we had all the luxury we missed in Cuba, like fresh drinking water, English speaking hosts and of course free wireless internet! After a quick internet session we went up to the terrace where we had a few beers with Linda and Penny from the US. Tom’s father Graham also showed up, so we ended up having a very late dinner at Charlie’s.